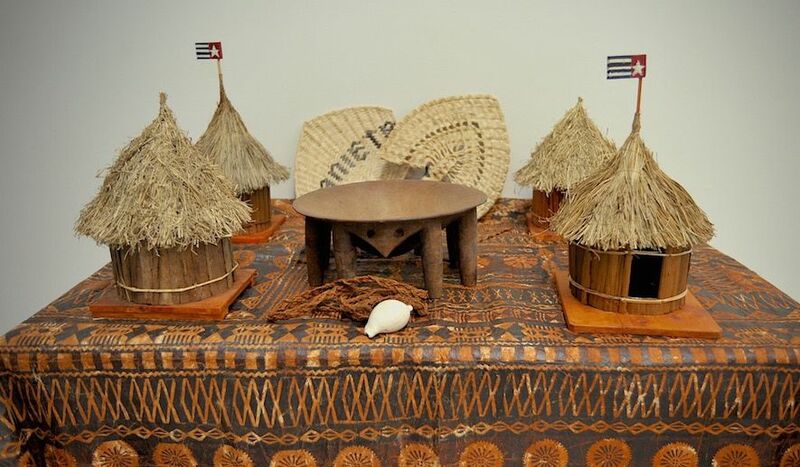 SALUTING MELANESIA was an exciting ceremonial occasion that brought together communities normally separated by sea-water to celebrate their origins and living cultures. 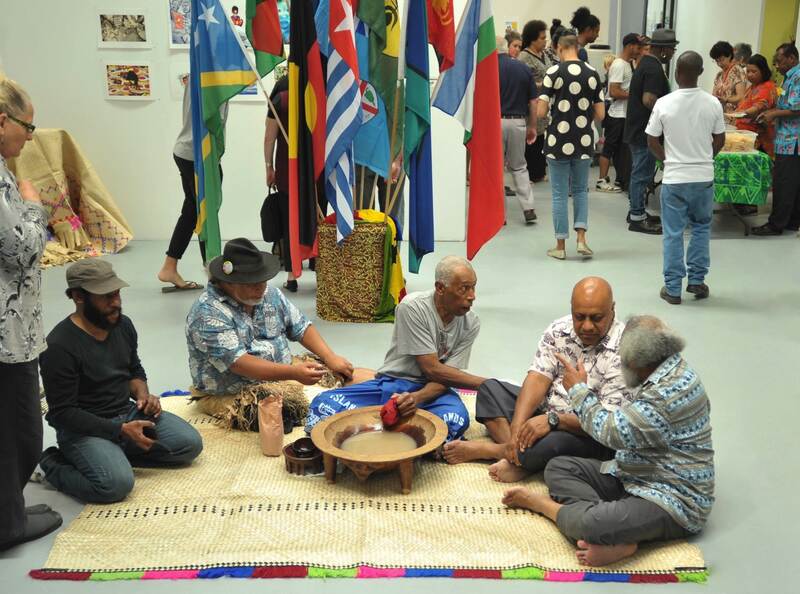 It began with a solemn kava ceremony, and included young Melanesians born or living in the diaspora talking about their cultural experiences, dancers performing their traditions, singer-songwriters telling tales about the past and the future, and, of course, a dazzling display of food featuring indigenous products and recipes. 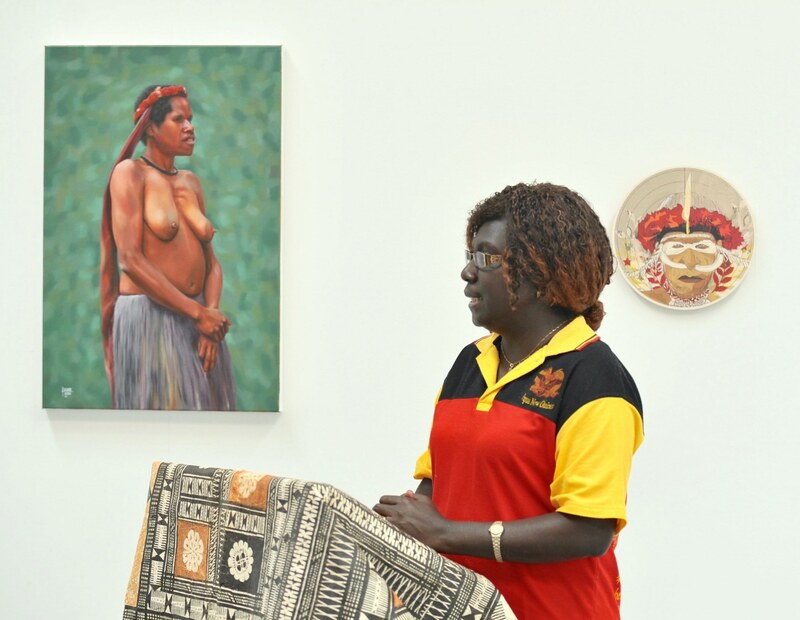 The Federal Republic of West Papua hosted the occasion in the AUSTRALIAN CATHOLIC UNIVERSITY’S luminous Art Gallery in Fitzroy during the SAMPARI ART EXHIBITION FOR WEST PAPUA, which in 2016 included a special MELANESIAN WALL OF ART. 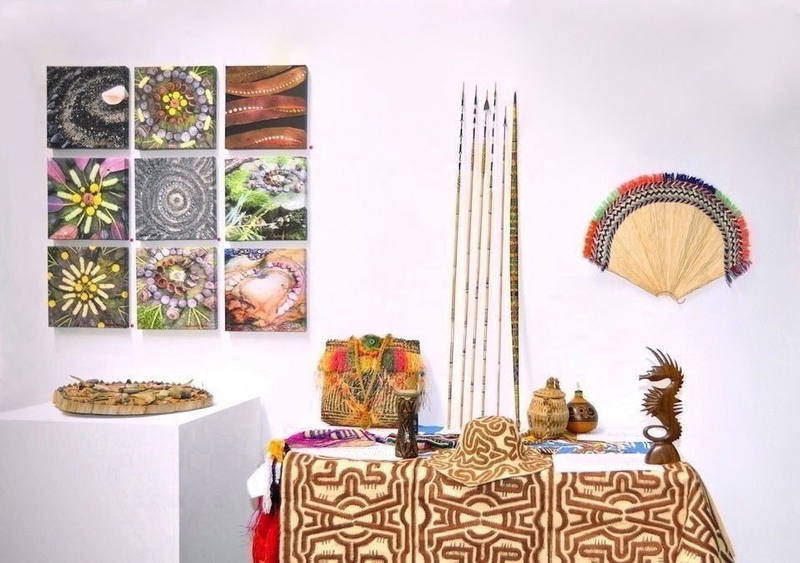 THE MELANESIAN WALL OF ART was a series of vibrant prints sent by artists from Solomon Islands, Vanuatu, West Papua, Fiji and Papua New Guinea. 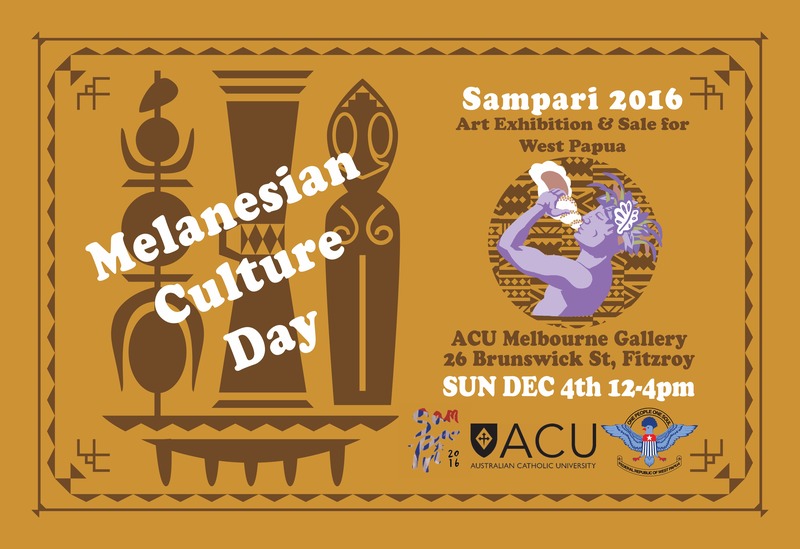 It celebrated the MELANESIAN SPEARHEAD GROUP’s historic decision in 2015 to accept West Papua’s application for membership. 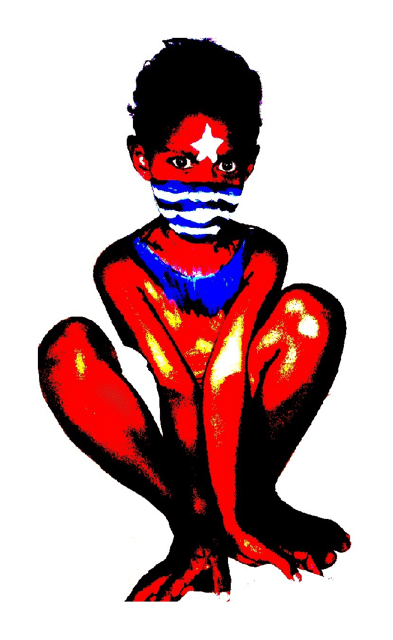 The MSG is a small intergovernmental forum, but its formal recognition of West Papuans sovereignty over their land catapulted its kin out of the isolation imposed on them on 1 May 1963 when Indonesian President Sukarno declared West Papua an Operational War Zone, banned foreign media, and reactivated old Dutch colonial laws of subversion. The MSG’s committment to shoulder passage of West Papua’s self-determination has been expensive. Indonesia tried to splinter the organisation with bribes, treaties, promises of aid and trade …. even applied for full membership itself based on an outrageous claim that it is home to eleven million Melanesians [see Note 1 below, Asia Pacific Report, 15 May 2015]. 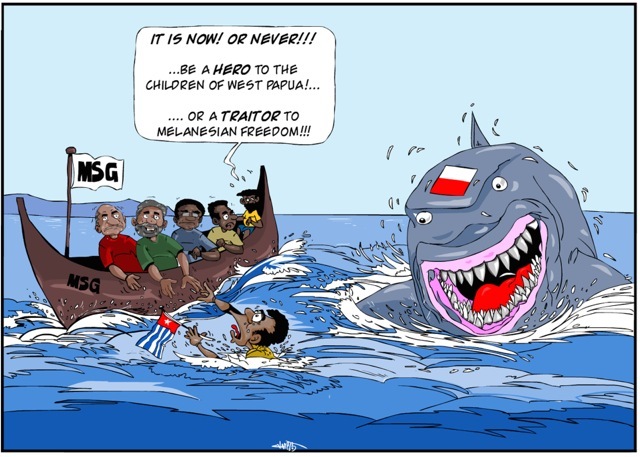 Indonesia’s machiavellian manoeuvres bulldozed chasms between Melanesian politicians and their communities, especially in PNG and Fiji whose leaders eventually endorsed Indonesia’s application for MSG membership (rather than West Papua’s). This decision by the MSG’s ‘older, bigger brothers’ divided them from the ‘younger, smaller siblings’ (Vanuatu, Solomons, the Kanak of New Caledonia), forcing the MSG Chair, Manessah Sogavare (Prime Minister, Solomon Islands) to accept both West Papua’s and Indonesia’s applications. This angered many, because it would enable a large wealthy mostly Muslim Asian state to sit in the motherhouse of four tiny predominately Christian Pacific nations. As a compromise, the MSG Secretariat decided to review its guidelines before formally responding to the applications. 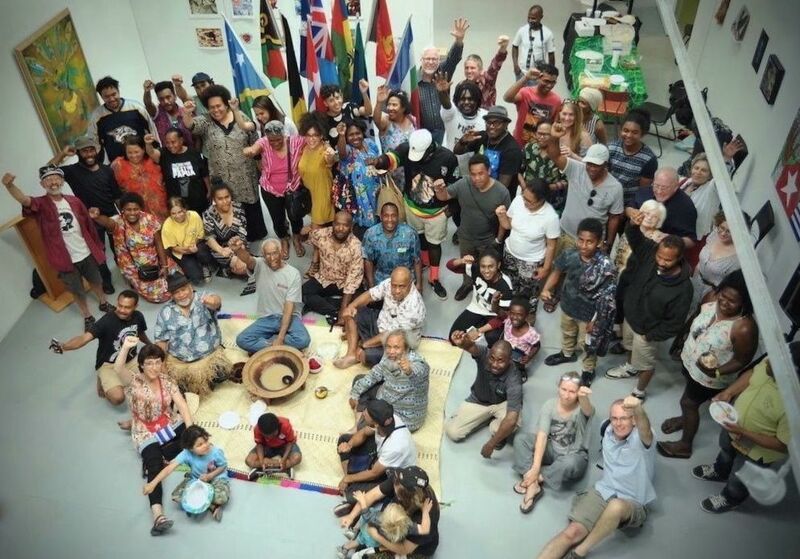 In 2016, the leaders of Polynesian and Miconesian nations—namely Tonga, Marshall Islands, Tuvalu, Nauru, Palau—joined the MSG petitioners as a PACIFIC COALITION FOR WEST PAPUA. Based at Hawai’i University, the Coalition initiated debate in the 71st UN General Assembly for West Papua to be reinserted on the UN DECOLONIZATION LIST, from which it was removed in 1969 after the New York Agreement’s fradulent Act of Free Choice ballot [see Note 2 below, Pacific Coalition for West Papua, December 2016]. 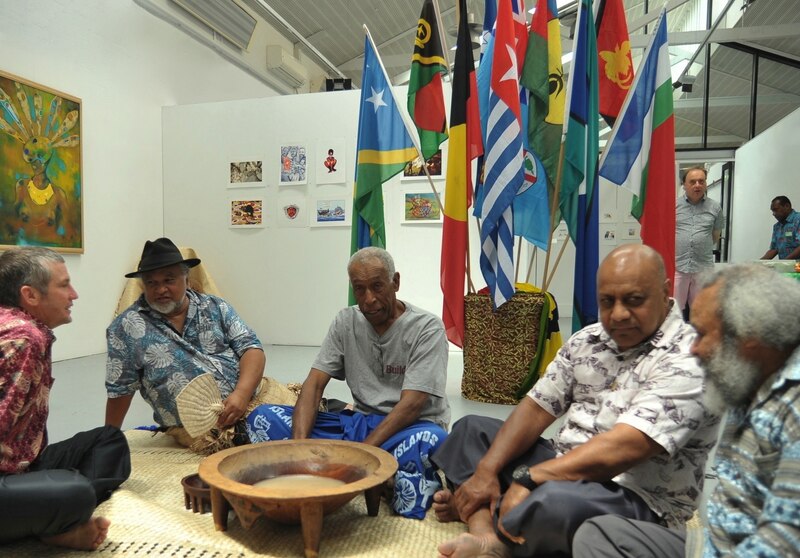 SALUTING MELANESIA in the ACU Art Gallery opened with a KAVA CEREMONY led by Bula Rendiring and Sef Suka Seviua, two Fiji chiefs who reside in Melbourne. 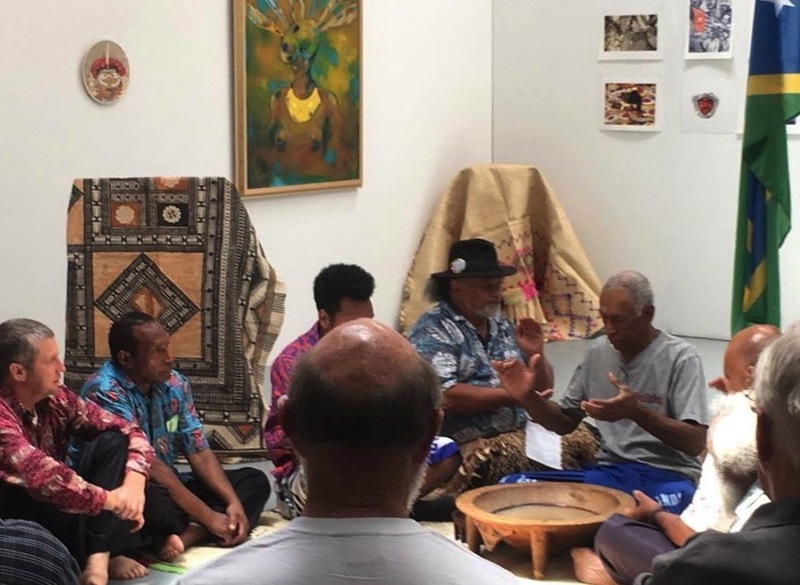 Before they mixed and served the kava to honoured guests, DR ROBERT WOLFGRAMM spoke to young Melanesians brought up and educated in Australia (where kava is illegal) about the relationship between kava and culture. 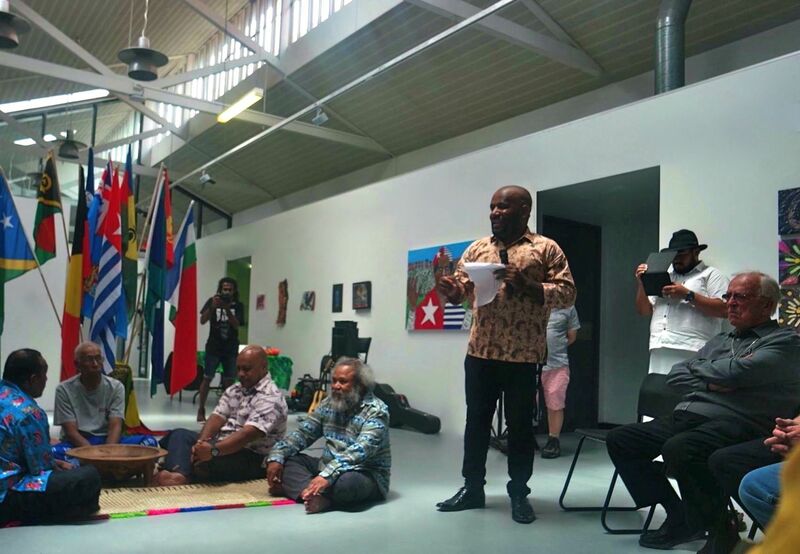 He talked of the plant’s origin in West Papua, its place in high culture and social discourse across indigenous Pacific cultures, stressing that kava is neither part of a bygone culture nor an appropriate alternative to alcohol [see Note 3 below, for full address]. 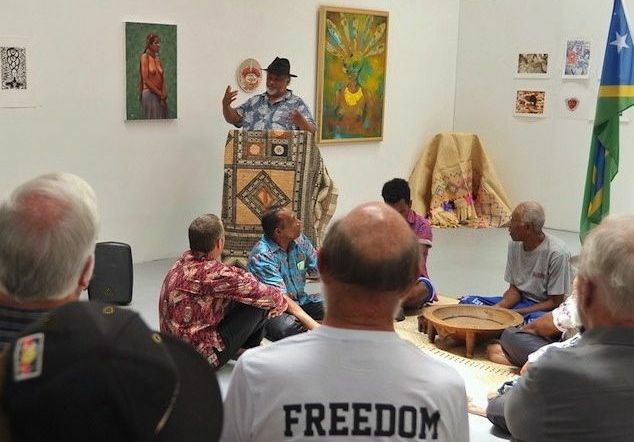 After the chief’s had implored the blessing of the ancestors, and their intercession on a series of stated community concerns and tribulations, they invited people in the gallery to sit on the kava mat with them while the feast prepared by DAPUR SAMPARI (Papua Kitchen) was being served. 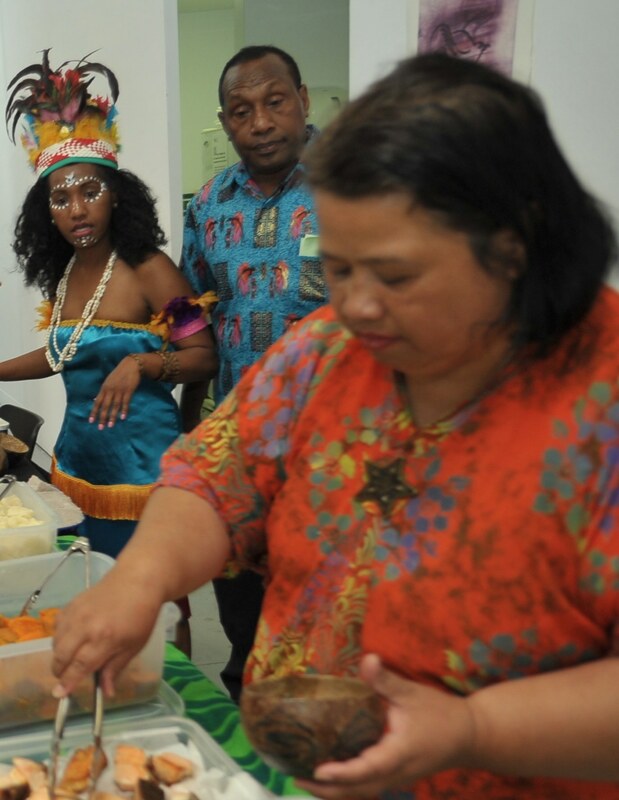 DAPUR SAMPARI (Papua kitchen) served Papuan recipes prepared by Natalie Adadikam and Babuan Mirino. 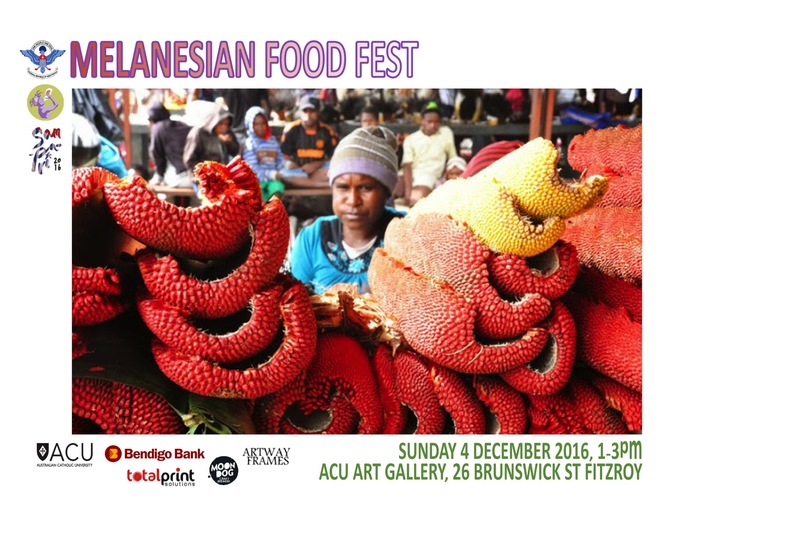 Traditional West Papuans have a seed-to-plate custom born of a history arcing back 7000-9000 years when they domesticated the wild ancestors of sugarcane, hibiscus spinach, highland pitpit, pandanus, taro, banana, and numerous other species. During this dry period, at the end of the last Ice Age, a drainage method (water control) was also perfected. Pig husbandry developed after Austronesian speakers arrived about 3,500 years ago. 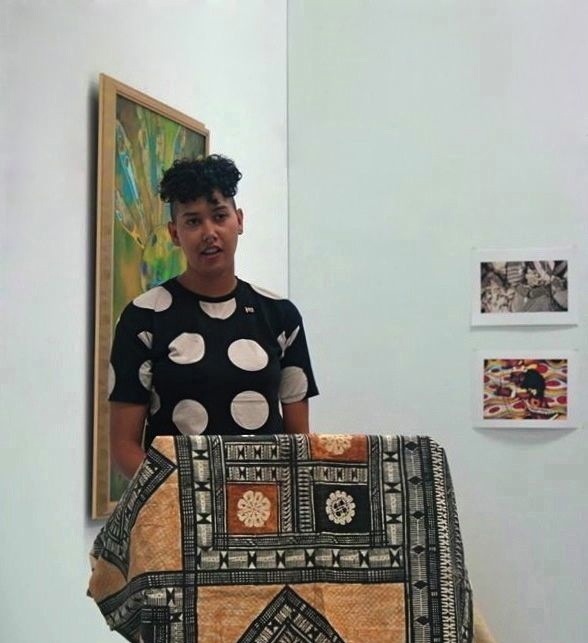 JEFRY JIKWA (below) is Dani from the Central Highlands in West Papua, and boated to Australia in 2006 in a traditional double-outrigger canoe seeking asylum with 42 other West Papuans. 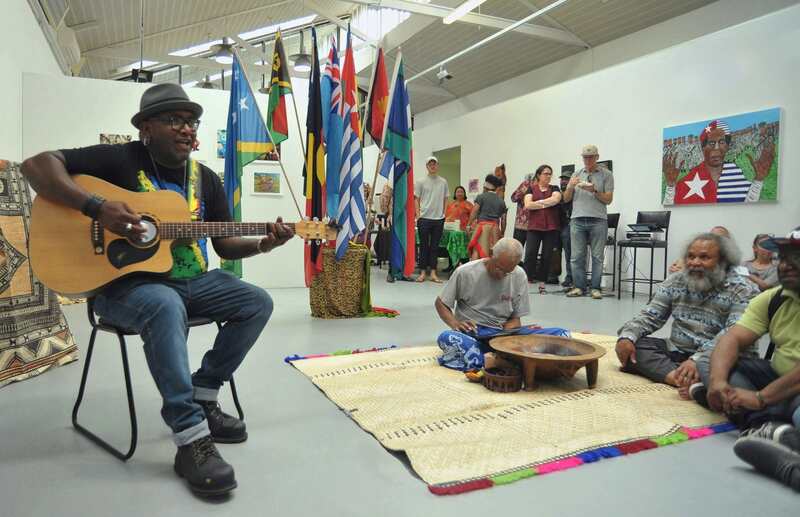 He organised Saluting Melanesia with Maluku independence advocate Tommy Latupeirissa, and introduced the Melanesian speakers and performers. He also acknowledged BISHOP HILTON DEAKIN (Patron of Australia West Papua Association-Melbourne) for his acute observations of the role of churches and activists in East Timor’s independence struggle. 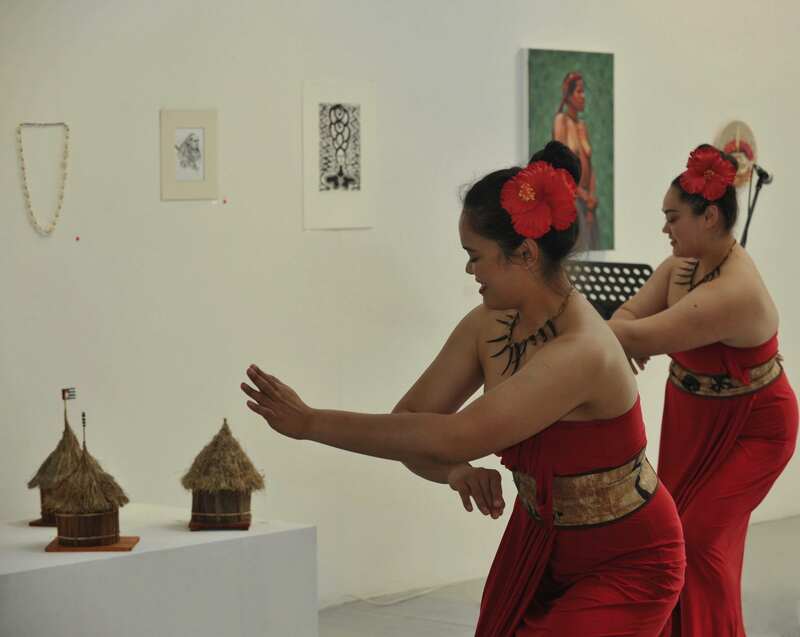 Three young West Papuans performed YOSPAN, a derivative of two dances, yosim and pancar, which were joined by edict in Jayapura in the early 1980s at a seminar convened to select the province’s official dance. Yosim, a slow jog, is an older dance from Sarmi. Pancar, from Biak, is of relatively recent origin, traceable to the military buildup that preceded the end of Dutch colonialism, when rumours of an impending Indonesian attack swept the island. Apparently the drills of Dutch fighter pilots inspired an artist to invent a step, pantja gas (‘jet’) that imitated an airplane entering a stall. (For more on Yospan, see Note 4 below). 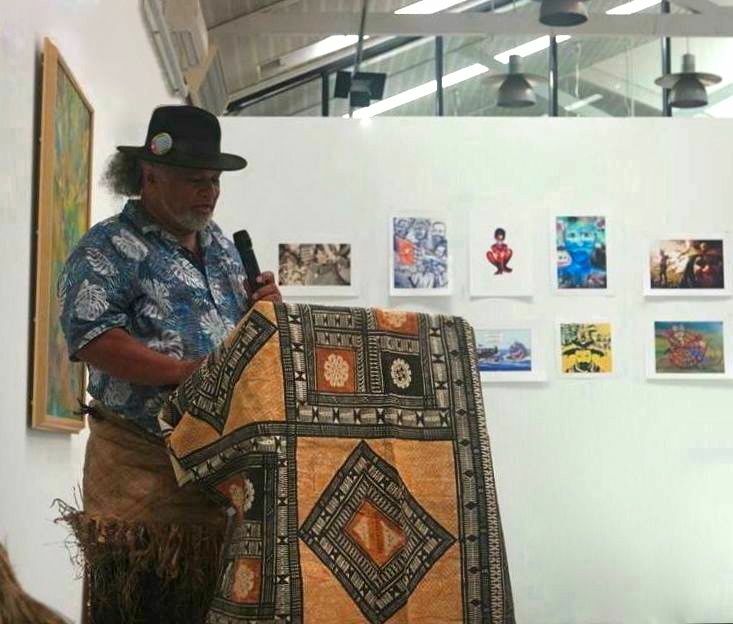 Robert Wolfgramm lectured in the School of Political and Social Inquiry at Monash University for decades; was editor-in-Chief of the Fiji Daily Post until the Bainimarama administration forced its closure in 2010; translator and editor of the New Fijian Translation Bible; coach of the Fiji junior team that won the AFL International Cup in 2011. He is also a musician of note and father of The Wolfgramm Sisters. 5. Bishop Hilton Deakin: a new book Bonded through tragedy; united in hope by Jim and Theresa D’Orsa investigates Bishop Hilton Deakin’s advocacy for East Timor’s self-determination from the time of the Santa Cruz Massacre in 1991 until the present day.